The purpose of the Windows 10 Action Center is to tell you what’s what and help you get things done faster. The top of the Action Center shows notifications from different apps — email messages, weather updates, and the like. The bottom of the Action Center provides quick action buttons that you can select to perform different tasks. Click or tap the Notifications button in the lower-right corner of the screen, as shown. The Action Center opens. You can also open the Action center by swiping from the left side of the screen or pressing the Windows key +A. Select the Expand button next to a notification at the top of the Action Center. Selecting this button enlarges the notification so you can read it better. Select the All Settings button. The Notification & Actions screen opens, as shown. Use this screen to tell Windows 10 what you want to see in the Action Center. In the Notification & Actions screen, drag the quick actions buttons to rearrange them in the Action Center. As the screen explains, you can rearrange these buttons by dragging them with the mouse or with your finger. 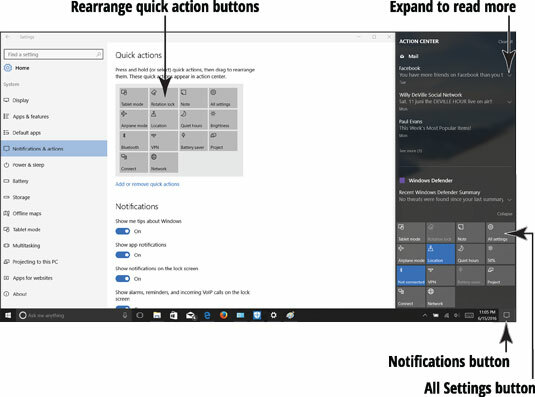 Under Notifications in the Notification & Actions screen, turn options on or off to tell Windows whether you want notifications to appear on your screen. Notifications are the sometimes annoying little message boxes that appear when you least expect it in the lower-right corner of the screen. Scroll down the Notification & Actions screen to the area called Show Notifications from These Apps. You see an alphabetical list of apps that can deliver notifications in the top half of the Action Center. Drag the On/Off sliders to tell Windows 10 which applications you want to deliver notifications. Select the Close button (the X) to close the Settings window.